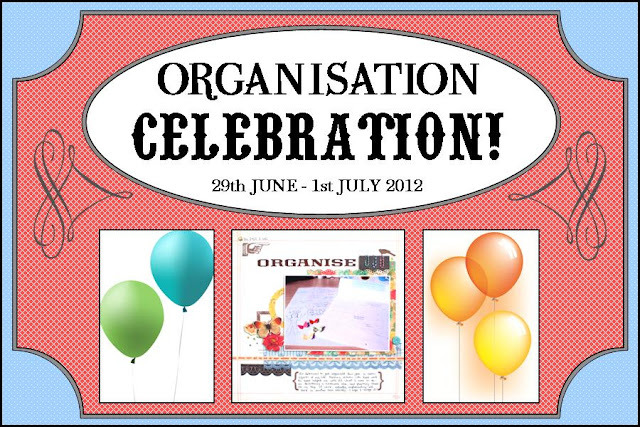 Inside My Head: Organisation Celebration Blog Hop! A little while ago, the lovely Jennifer, a fellow DT member at S J Crafts, asked if I would like to join in with her Organisation Celebration Blog Hop. "Some of you may have seen my ‘word for the year’ – ORGANISE, which I blogged about in January here. As it will soon be half way through the year, I thought I’d spend some time telling you about the things that are working for me so far. 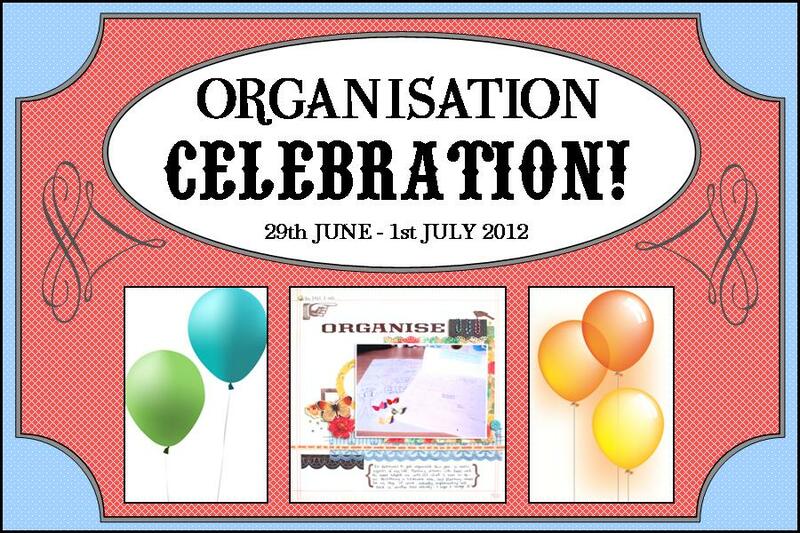 So on Friday 29th June – Sunday 1st July I’ll be having an ‘Organisation Celebration’ here at Jennifer's Jumbles. There will be posts every hour from 4pm-10pm Friday, and 10am-10pm Saturday and Sunday (BST), including a blog hop, tips, tutorials, challenges, crafts, and lots of GIVEAWAYS!" Of course, time cracked on and suddenly it was this week and I thought, what on earth can I say?! I was about to start packing for a crop and I was getting sidetracked by someone on Facebook asking what they should take when they went on their retreat. Kapow! So my own post in the hop is all about how I personally prepare to scrap away from home. Each person in the hop is sharing something different and each lovely blog has a letter for you to collect (mine is near the end of the post). I am honoured to be sharing a hop with some of these uber talented ladies and you are sure to find a new blog to follow if you don't already have them in your list. Once you've got all the letters (12 on the different blogs and 2 on Jennifer's own blog), you can email Jennifer the phrase you've collected. All entries must be received by Monday the 2nd of July at 11.59pm BST, and all the correct answers will be put into a draw to win a gorgeous prize package of October Afternoon 9 to 5 and Studio Calico Take Note items, worth over £25! How utterly fabulous is that?! Thanks Jennifer! Here's a list of all the blogs in the hop, in the correct order, in case you get lost. With the essentials taken care of, I set about planning my pages. Unless I am working with a specific set of papers for a DT submission, I tend to start with the photos using whatever I fancy. Usually there is some subliminal reason for choosing the ones I do, perhaps I have seen a particular idea I want to try or a particular collection or embellishment to use or a certain story to tell. I lay them on my desk and then select a few papers to use with them. Then I choose a couple of possible colours of cardstock. I also add a few spares of cardstock in kraft, white, vanilla and a couple of "dodgy" pieces. These are strange coloured or marked pieces that I use to adhere a page onto if I am constructing it out of pieces pattered paper, or to make templates etc. You can see the piles progressing at the bottom of this picture. On my trimmer you can see that I've printed off some inspiration and ideas. 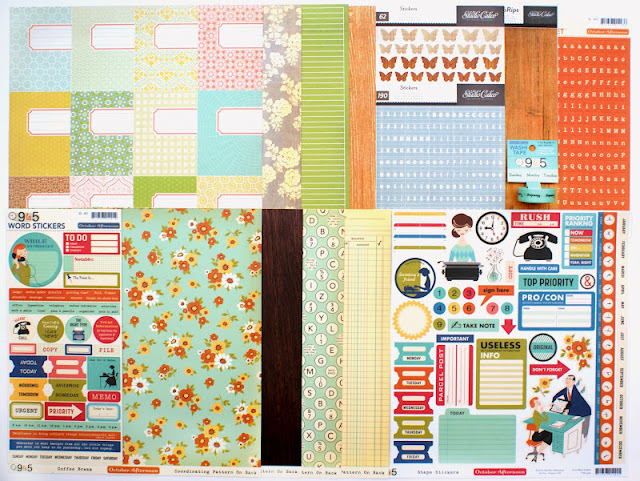 These are from my Pinterest board and I often use these to help me plan my pages. I keep these individually on the pile with my photos and papers. Then I add sticker sheets and letters, die cuts and chip boards. Next I go through my embellishment box to see if anything will fit with what I have chosen. Lastly I add texture to the piles with ribbons, buttons, brads and gems etc. When I've got everything I might need in a pile, I place the individual page kits in a poly bag and add it to my craft bag. I usually have a few in there already from the previous crop as I never complete the volume I attempt! I've also got an idea but this stage if there is anything else I need to take like dies and punches and larger tools. I always take my little trimmer in my bag and a guillotine in the blue bag. Its not fool proof obviously and I do tend to get wherever I am going and think "ooh if I had brought that particular ribbon, or that label or that punch etc" but in the main I can get to a point where I only have to finish an odd touch here and there back at home. This is one of the layouts I completed at last Saturdays crop and I managed to finish it entirely, including journalling, away from home. It features Bella and her Daddy in sunny Wales and uses almost entirely scraps. I scrap-lifted this from one of my Pinterest layouts from Scrapbook.com and I love the way it turned out even I was twitching by the time I had cut, inked and randomised all those scalloped circles! I'm admitting to using scraps of plastic from toy packaging here and it looks odd as a close up but I'm happy with how it looks on the layout overall. So now you need a letter to send you on your way back to Jennifer, am I right? Well the letter you need is "Y". Now go, hop around, and tell Jen I sent ya! I"m also a tote bag girl - I have tons of them, and I fill them up when I grow cropping. Sounds like you are VERY organised. Your work shows your attention to detail. Great page - I love making up page kits too - trouble is then I want to make the page straight away! Wow! That page looks brilliant. Must have taken you a very long time to punch and ink all those pieces. I love the yellow and grey colour combination. Your tips will come in handy when I go on my second retreat next year. My packing was hopeless this time! It was me who asked the question on Facebook, all I can say is THANK YOU SO VERY MUCH... I am inspired. Now I am off to re organised my retreat supplies. 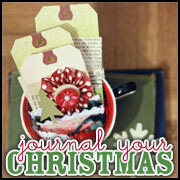 Your layout is fantastic, I love all those scalloped circles, they were well worth the effort I think! The crop packing looks great too, I never been to a crop yet, but I like the idea of packing page kits if I ever go to one! oooh i love all those scalloped circles on your layout Lisa-Jane. You look super organised too. My God woman! Talk about uber!! Wow, you've got it all together. I have a spinner organizer at home for all my essential tools and I transfer those to a tote similar to yours for a crop. But I haven't been to a crop in ages - I must remed"Y" that. Oh, I forgot to say that I pinned your layout - so it will make its way around Pinterest as well. Oh my! I can't believe that you inked all of those scallops as well! That takes dedication, not just organisation! Phew!